Instructions: Click here to view a larger photo of this project. Cut a piece of the pink cardstock 12"x 6", score at 6" and fold in half. Place the outer cutting die slightly over the edge of the fold and cut to create a folded card. Score half way from the top to create the easel card. Die cut the outer edge of the acorn die from the blush pink cardstock and adhere to the bottom half of the top of the easel card. Die cut two outer pieces of the acorn out of patterned paper and slightly trimming one at the top adhere to the bottom of the easel. Adhere the other die cut paper to the top of the card. Stamp the acorn image from the HCPC-3840 Oakberry Cottage & Sentiments Stamp set in Coffee ink on white cardstock and die cut with the coordinating dies. Colour the acorn with Coffee ink, the caterpillar with Vivid Chartreuse ink and the butterfly with Majestic Violet ink. Die cut the windows out and colour with vermillion. Colour the squirrel with Bisque, Coffee Brown and Sepia ink. Using a Dove Blender pen colour the pies with Peanut Brittle ink and the apron with Majestic Violet ink. Adhere the coloured images to the base patterned paper and adhere to the top of the card. Stamp the squirrel from the HCPC-3839 Furry-Tailed Frolic stamp set holding out the nut in Coffee Brown ink on white cardstock. Colour in with Bisque, Coffee and Sepia ink, shape lightly and adhere to the right front of the top. Stamp the leaves from the HCPC-3842 Oakberry Lane Blossoms stamp set in Library Green ink on flower shaping cardstock, colour in with Fern Green, Leaf Green and Majestic Violet inks before die cutting with the coordinating die. Shape using the coordinating mold and assemble when dry and add Crystal Clear glitter with Dries Clear glue and adhere at the top of the acorn and on the bottom of the easel to create a shelf for the top of the easel to sit against. Stamp the flowers from the HCPC-3842 Oakberry Lane Blossoms stamp set in Majestic Violet ink on white flower making cardstock and die cut with the coordinating dies. 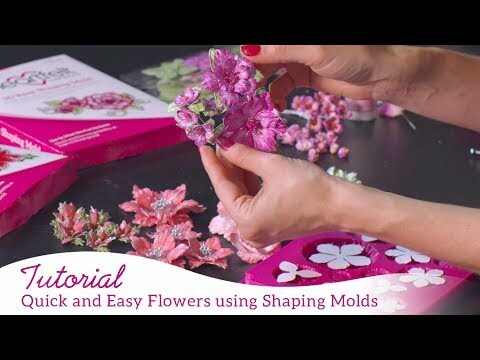 Sponge the outer edges with Majestic Violet ink and the middle of the flowers with Vivid Chartreuse ink and shape using the coordinating mold. Assemble when dry and add Crystal Clear glitter to the flowers and the Lettuce Entertain You Prills to the centres. Adhere to the top of the acorn and on the base of the easel over the leaves. 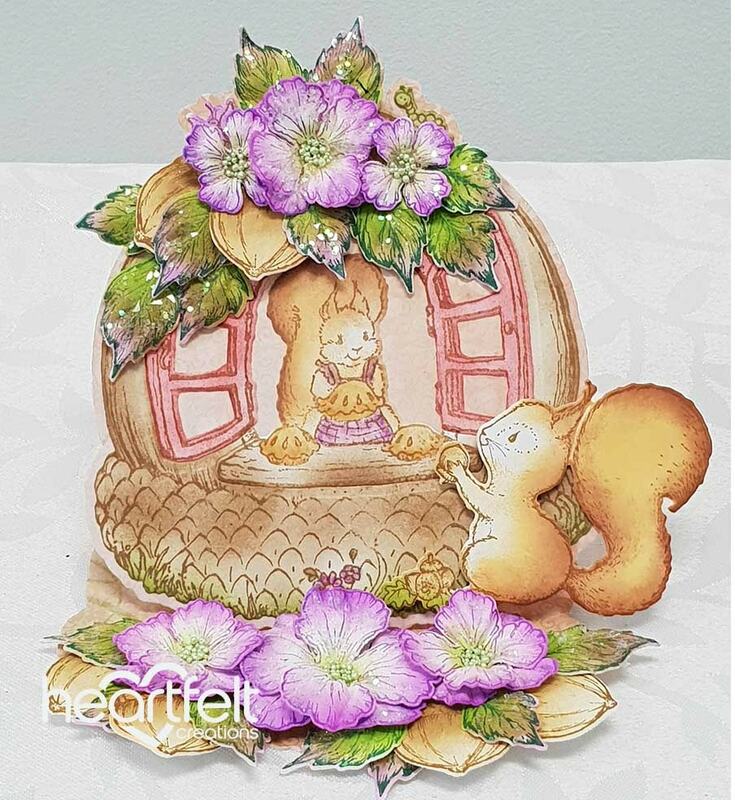 Stamp the acorns from the HCPC-3840 Oakberry Cottage & Sentiments Stamp set in Coffee ink on white cardstock and colour with Coffee ink. Die cut with the coordinating die, shape and adhere among the leaves and flowers as shown.